In one of the previous post, I mentioned, How MVC3 and Web Forms can exist side by side in one project. 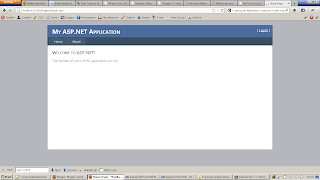 We also saw, how we could Enable Dependency Injection using Spring.NET in an MVC3 Application. But, What about the old Web Form pages and user controls? Can we Enable Dependency Injection in them, so that we can create loosely coupled code? Surely there is a way of doing this using Spring.NET. In this post we will carry on from where we left and we will try to enable Dependency Injection even for Web Pages and User Controls. Before moving any further, if you have not already seen my previous post of integrating Spring.NET with MVC3 Application, now is a good time to see it. Our task is to inject the AccountService into the Default.aspx page. As mentioned in the previous post AccountService is a class that was already configured in Spring.NET, it has one method UserCount and we are going to show the user count on the Default.aspx page. Let look at each step in more detail. This step is pretty straight forward all we need to do is, Add an HttpHandler, called Spring.Web.Support.PageHandlerFactory. We need to configure it against the path *.aspx. This is required so that, Spring.NET gets an opportunity to perform Dependency Injection when a request comes for any web-forms web page. 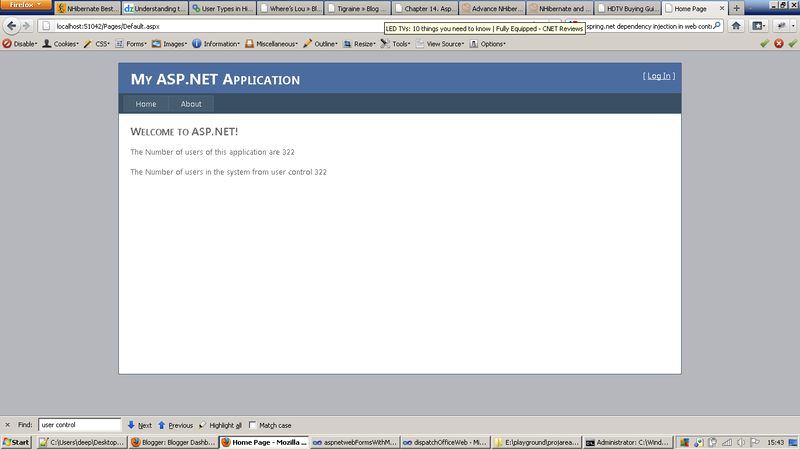 ]]> As you can see the html code of Default.aspx is very simple. It just has a label called userCount which will hold the value of number of users in the system. We will get the value of userCount from AccoutService. Let's look at the code of Default.aspx.cs file The code of Default.aspx.cs has no surprises, it has a property AccoutService. We will plan to injet an implementation of AccoutService using Spring.NET. In the Page_Load method, we simply set the userCount label with the value returned by the UserCount method of AccoutService. The only question left to answer is, how do we inject the AccoutService into the Default.aspx.cs. ]]> Notice that we simply have to add the declaration of Default.aspx with proper path in web.xml. Since, Default.aspx is located in the Pages directory, we have to refer it as ~/Pages/Default.aspx. 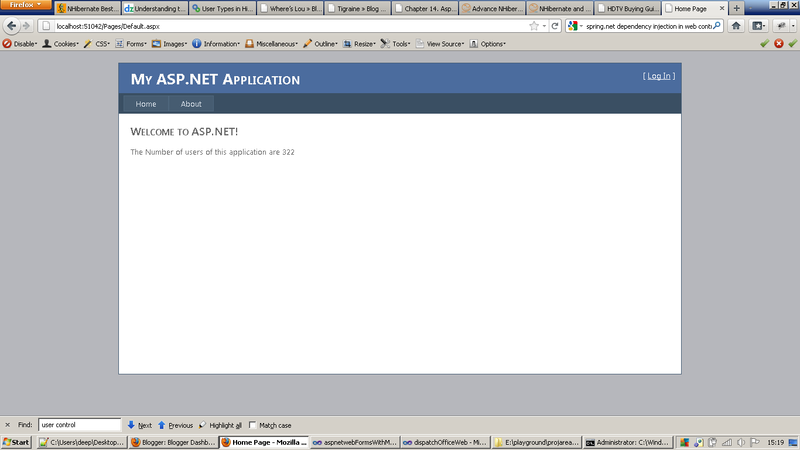 We have to add all the dependencies for the page, just like how we do it for other Spring.NET objects. All set, lets test our setup and browser the page Default.aspx to see the result. As you can see, we are able to see the user count value on the page. We have successfully Enabled Dependency Injection in Web-Forms Web Pages. We are going to create a very simple user control. Let's call it UserCont.ascx. This user control will simply fetch the user count using the AccountService and show it on the UI. ]]> The code of UserCount.ascx is very simillar to what we have already seen in Default.aspx. We are setting the value of userCount label by invoking the UserCount() method of AccountService instance. Notice that, we are not instantiating AccountService anywhere in the user control. We will inject it using Spring.NET. Before we look at, how exactly we do that lets update the Default.aspx to make use of the UserCount.ascx user control. ]]> Nothing very alarming here. We simply are including the user control UserCount.ascx and showing it on the html. The final step is to configure the UserCount.ascx in web.xml. Here is how we do it. ]]> Notice that we registered the UserCount.ascx in Spring.NET configuration file. We simply have to specify the complete path of the UserCount.ascx. Notice that we didn't have to change the configuration for Default.aspx at all. Spring.NET is smart enought to inject the correct instance of UserCount.ascx in Default.aspx. Another important thing to notice is that we have to add abstract="true" to the declaration of UserCount.ascx. As we can see, we see two lines on the page showing the UserCount, first one is getting the user count directly from Default.aspx web page, while the second line is coming from the UserCount.ascx user control. Nice post. haven't try this to see work. But I guess this works. Thanks for posting.